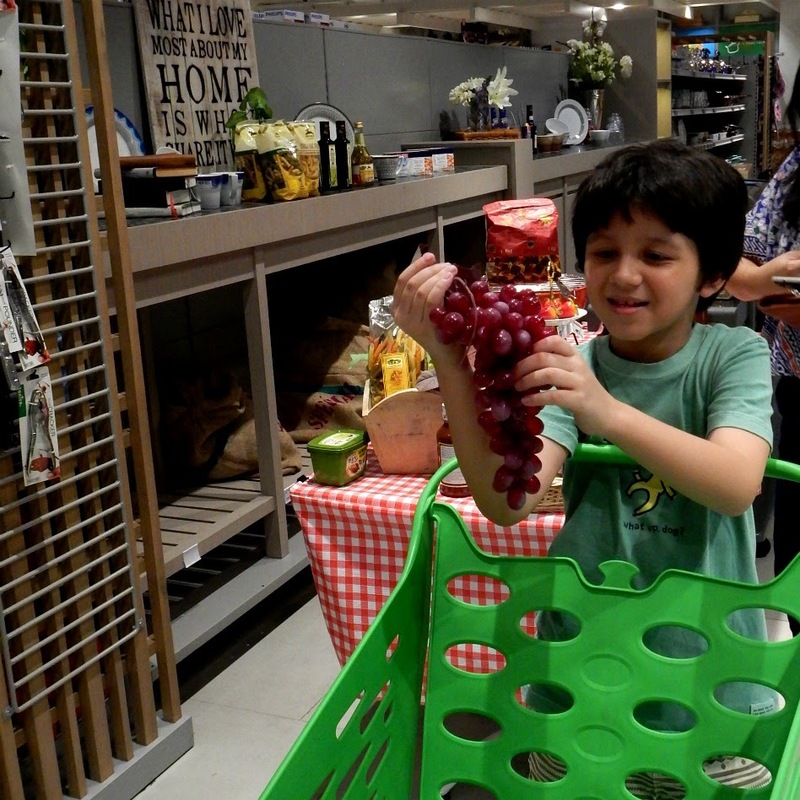 Curiosity sparked by a radio commercial brought us to Alam Sutera to pay this bright yet kids friendly supermarket a visit. My first impression with the visit is how this supermarket reminds me of the ones I found abroad. The bright-colored trolleys and baskets take us by surprised and get Dudu excited. Even better, it comes in children size. Without hesitation, Dudu goes with his favorite green. What I love the most about this place is the fresh fruit and vegetables welcoming us right after the trolley station. Sure, it was more expensive than your neighborhood traditional market, but comparisons are valid when it's apple to apple. The supermarket has a good selection of items and an alley of Indonesian traditional food and snack. They sell Rendang Uda Gembul (which was vacuum-packed so you can easily bring them abroad in your suitcase) and the hilariously-packaged Chocodot (need a boost for final exam, grab one of this choco and read their tips). The supermarket has children check-out too. But what brings me back is Philocoffee -- the super comfy coffee shop and bakery next door. According to the ads, Loka often held activities for children, so check out their official web before going, especially when you don't live in the area and had to put an effort to visit Loka. Come early -- somehow Alam Sutra isn't as cool as I imagined. When we were there it was quite hot walking from the car to the supermarket. Also, if you come early on weekends, stay at Philocoffee for breakfast. It was a nice coffee shop.